Yes, I know, you don’t think Microsoft can keep your users from going rogue and using the abundance of tools now available online. You still have Outlook and the rest of the Office Suite to work on your documents, but then you use 4 or 5 different online tools depending on how your team works. The problem is, and always has been, choice. If IT proclaims one tool to rule all of the work scenarios, it is bound to dissatisfy a number of your users that will then seek a solution elsewhere. People in your company, teams, need to be able to choose the best solution of work for their needs and expectations. So Microsoft decided to bet on the 3Gs with Office 365. It all began when Microsoft showed the vision for the Future of SharePoint on May 4th 2016. Showed a clear intent on “resetting” SharePoint and allowing it to be easier to use, as well as up to today’s expectations from such a product. But without removing any of its enterprise content management features either. Some asked, it seems they just re-did the core of SharePoint, what’s so cool about that? Bear with me, first let’s discuss the 3Gs with Office 365. Create a Group made up of internal and external users, and use that group to work with and access every product in the Office 365 Suite. Almost like a Next-Gen Distribution List because the Group, amongst other things, gets an inbox to send and receive emails with. But it’s much, much more than that. This is the magic behind the scenes. Everything done using any of the Office 365 products is captured as signals, and thus allows for cross application content discovery. Imagine being shown the documents you’ll need for your next meeting without looking for them. Office Graph is connected to your calendar and to your documents, and can make better decisions because of that. Again, more added to have as much cross application security and compliance capabilities as possible. 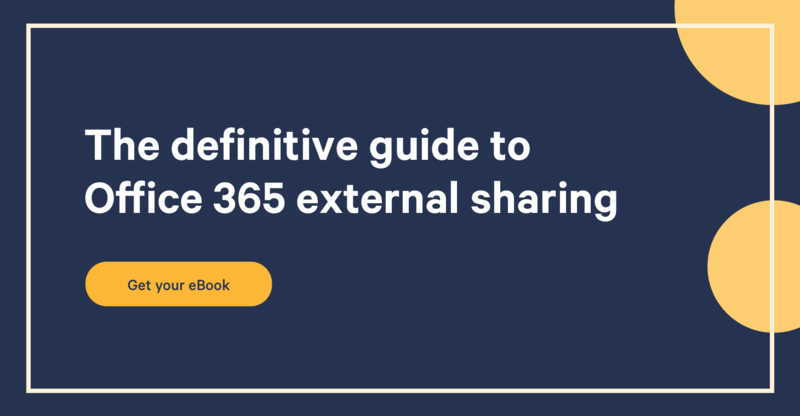 With security and external users managed in the Office 365 Group, there's less of a need to go to each individual product and make your changes there. With eDiscovery features, and more and more management capabilities being added, the barrier between products in Office 365 is disappearing. Think about it this way, instead of forcing your users to use one product or the other, thinking it'll hit 80% of scenarios, Microsoft offers choice. Here is the Office 365 Suite with all of the products that are great at what they do, and linking all of them are: Cross Application Groups, Cross Application Content Discovery (Graph), and Cross Application Management and Governance. Image provided by Christophe Fiessinger Office 365 product manager, you can find him on Twitter. See my own version of the Office 365 wheel if it helps. Some teams may prefer to start with just a Calendar and weekly Skype Meetings. But eventually as the team grows, or the workload for that team changes, they can evolve and consume another product that delivers on their requirements. Instead of giving everyone a SharePoint site and torturing it to do a calendar, or a task list, or a video learning center, you let them choose what they would prefer using. By giving them the choice, you're encouraging them to stay within your organization. And yet, even though they start spreading on the different products available, it's still all linked together by the Office 365 Group they're in, and the Office Graph capturing all the signals created. Why Did Microsoft Focus on Refreshing SharePoint Sites and Not Add More Features? Take a look at Tesla. Sometimes, to reinvent something, you need to go back to the basics. Tesla isn’t popular because it added a whole list of new features on an existing product (car). No, they went back to what it is to be a car, and started again from there based on today’s expectations and requirements. Microsoft just did the same with SharePoint. It allows some teams that just want a File Share type of experience to use it easily for that, but also empower those that need a full scale SharePoint Enterprise Team Site. With this new direction for SharePoint, it allows it to fit in a way that is going to transform how teams work in our organization. Start in your OneDrive for Business, as an individual perhaps sharing the file with one or two others. Then it evolves into a project, so you create an Office 365 Group for it and add members to the Group. This automatically goes and provisions things like a SharePoint Team Site, a Yammer Group, an Outlook Inbox and Calendar, Planner Board, a Power BI dashboard, etc… and makes sure all the permissions are set accordingly. From there, the team can choose the best way to work for them with the product in the suite that fits their needs at the moment. They may just need the Calendar for now, and in 2 months’ start managing tasks using Planner. Collaboration goes beyond the SharePoint Site, and this new model helps us take advantage of the entire Office 365 Suite to change how our teams work.